Yamal LNG has been discussed since the mid-2000s. It used to be a French-Russian project in nature, since Total and Novatek were the majority shareholders. In 2014, in response to the annexation of Crimea and the crisis in eastern Ukraine, Western countries imposed an array of commercial and sectorial sanctions targeting Russia’s financial services and energy sectors, as well as defence and related materials. This paper explores the following questions: how do sanctions impact American-European and European-Russian relations? What responses does U.S. law extraterritoriality incite from European countries with strong economic ties with Russia? Are European energy companies doing business in the Russian energy field suffering under sanctions? Last but not least, how dependent is Russia on Western support to carry out its energy projects both from a technological and financial perspective and what will be the Russian response to this challenge? From the Russian perspective, Yamal LNG is not just an economic stake, it has also become a political issue. As a result of the sanctions the project was put out of the traditional international project finance market and has faced challenges concerning the supply of key equipment. The more negotiations have dragged on with European Financial Institutions, the more the Russians have turned to alternative options in Asia. When the United States got wind of the construction of a Siberian gas pipeline which was slated to be built by Western firms in order to link Soviet gas fields to Western Europe, it imposed unilateral economic sanctions on Soviet gas pipeline construction in 1981. It was no surprise that the United States initiated sanctions in the energy sector since the Soviet Union turned into a petro-state when oil prices spiked during the 1970s1, and oil and gas revenues began to play a crucial role in the Soviet economic development from that time on. Sanctions called into question the concept of the détente era peace-through-trade strategy, as it deteriorated the political environment and considerably weakened economic ties. It is of note that Western Europe tended to see trade interdependence with the USSR as a fairly positive factor. Sanctions were lifted in November 1982. While they did not achieve the desired effect of stopping the project, they raised a number of issues pertaining to American-European and European-Soviet relations. It is highly likely that U.S. sanctions forced the Soviet Union to restructure its economic ties with Western Europe in order to diminish the impact of possible future actions by the West. However, Western European countries, such as France and West Germany, refused to support U.S. sanctions, inasmuch as it would have acknowledged the extraterritoriality of U.S. law, which they perceived as a violation of their sovereignty. At that time, some Soviet commentators perceived the U.S. decision as “inter-capitalist economic warfare” due to the fact that the sanctions might have had serious consequences for European economies and companies.2 In the USSR, the situation also opened up the debate on Soviet dependence on new technology from the West. Although the 1981 and 2014 sanctions differ widely, they raise analogous questions. How do sanctions impact European-Russian and American-European relations? Does U.S. law extraterritoriality provoke responses from European countries with strong economic ties with Russia? Are European energy companies involved in the Russian energy field suffering under sanctions? Last but not least, how dependent is Russia on Western support to carry out its energy projects from a technological and financial perspective? Theoretically sanction-induced financing constraints coupled with low energy prices could lead to delays in long and medium-term key projects such as Yamal LNG – the crux of this study –, and cause irreparable harm to the Russian economy in the not too distant future. Nevertheless, it would be mistaken to consider that Russia has only a limited ability to respond to Western sanctions in kind. In order to weather the storm, energy companies involved in this project have been restructuring their ties to financial institutions (FIs) which have participated in financing this Russian large-scale project hitherto with a view to diminishing the impact of possible future actions by the West. On the one hand, the Russians have to secure the necessary funds to proceed with capital-intensive projects and find new credit lines. This is a major challenge, the outcome of which will significantly impact Russian-Asian relations. The deterioration of the relationship between the West and Russia works in China’s favour. On the other hand, traditional European partners involved in the projects, such as France’s Total S.A., have to not only rethink their own relationship with Russian partners, but also with European FIs and credit insurers. The latter are now facing new major risks resulting from economic sanctions previously mentioned, but also secondary sanctions. It is too early to assess the results of the sanctions, due to the fact that they coincide with the collapse of oil prices, which has hit the Russian energy sector hard. Nevertheless, one can observe some structural changes and new trends underway leading to a partial reshaping of projects. The main aim of this study is to analyse this gradual overhaul and the consequences arising from the current situation by scrutinizing the flagship Yamal LNG project. This mega-project is for natural gas production, liquefaction and marketing of the South-Tambeyskoye natural gas field located in the northeastern part of the Yamal peninsula (in Russia’s Yamalo-Nenets Autonomous Okrug). The full project includes three trains with an overall capacity of 16.5 million metric tons (mmt) per year, and a field production potential of 27 billion cubic meters (Bcm) of natural gas per annum. The Final Investment Decision was signed in 2013 and the first train should be operational by the end of 2017, while the full capacity is scheduled to be reached around 2020. In this paper we attempt to first analyse the rationale behind the Yamal LNG project prior to the adoption of Western sanctions against Russia. The second part highlights the application and the scope of sanctions in the energy field, and the way they negatively impact the financing of Yamal LNG by introducing new risks that FIs cannot take. In the final part, we will examine the way Novatek, with the support of the Russian state, is looking for alternative financing methods to complete the project on time. Before being transferred to Novatek, the marketability of Yamal LNG was a matter of concern. The project gradually gained momentum when Novatek started attracting international oil companies to facilitate its marketing. The structure of the project took quite a long time to shape and evolved as a function of the financing needs. In 2010-2011, the Russian company approached leading contenders active worldwide in the LNG field, asking them to acquire stakes in Yamal LNG – GDF-Suez (Engie since 2015), ConocoPhillips, ExxonMobil, Mitsui and Mitsubishi, Respol, ONGC and Qatar Petroleum. On Novatek’s side, the structure of the project was initially the following: 51 percent owned by the Russian side, and 49 percent by three or four foreign partners that would provide technological and financial support for the project.10 It is little wonder that U.S. and Qatari majors showed no particular interest, since the development of liquefaction LNG plants would have helped Russia gain more flexibility at a time when these two countries were massively investing or about to invest in LNG plants. For example, the U.S. Department of Energy granted authorization for the Sabine Pass terminal to export to non-free trade agreement countries in May 201111, and Qatargas 3 started production the same year12. In the autumn of 2011, OAO Yamal LNG became a joint venture owned respectively by Novatek (80 percent) and Total (20 percent, for 425 million USD)13. In April 2011, the French company had already bought 12.0869 percent of shares of Novatek14. The third shareholder changed in September 2013, when China’s CNPC signed a memorandum to join the consortium and purchase a 20-percent equity share in Yamal LNG for 1 billion USD (Novatek sold 20 percent of its stakes). The deal was finalized by the end of that year, when the Russia-Ukrainian crisis was already inflaming15. It offered the Chinese company access to Russian LNG, while the Russian company signed a 15-year supply contract for a minimum of 3 mmt of LNG/year from Yamal to China. 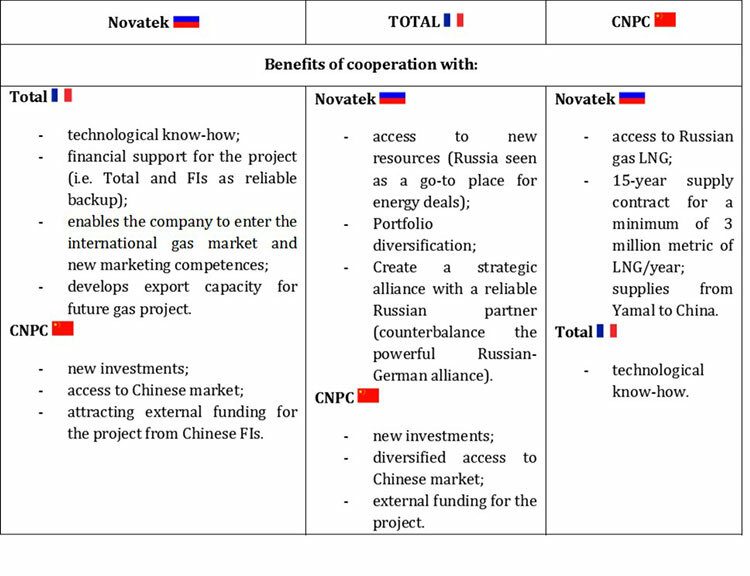 Yamal LNG is a French-Russian project in nature, since Total and Novatek were the main shareholders from the very beginning. For the French company, Russia, and specifically the Yamal LNG project, are of paramount importance for the following reasons. Firstly, Total faced a risk that most of the “easy to access” hydrocarbon resources has been produced and consumed. In 2011, it launched an audacious strategy for exploration and production called “nouvelles frontières” (new borders)18, the purpose of which was to allow for the discovery of giant fields. The major had to get access to new resources and Russia was seen as the go-to place. Russia was perceived as a producing country with a fairly acceptable degree of risk. Since the early 1990s, Total had succeeded in gaining a strong knowledge of Russia and had developed an extensive presence in the Russian energy field, as well as a network of influential partners. 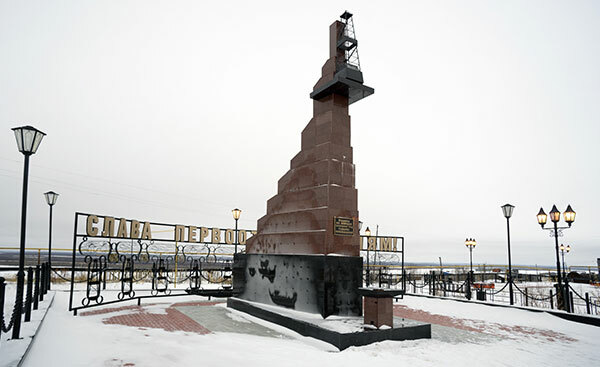 For example, it was the operator of the Kharyaga field (40 percent) located in the Nenets Autonomous Okrug, where development started in 1999 on the basis of a production sharing agreement (PSA) together with Statoil (30 percent), Zarubezhneft (20 percent) and Nenets Oil Company (10 percent). A PSA is a contract between investors and the Russian government. According to the terms of a PSA, “the government hires the investor(-s) as a contractor for the extraction of mineral resources, but the government still retains ownership of the resources”19. For example, Total financed and carried out exploration and production operations in exchange for a certain amount of oil and/or gas for the recovery of costs. Taxes and payments are generally determined by the PSA. The use of this commercial contract was abandoned by the Russian government in the 2000s, mainly due to the complexities associated with contracting procedures. Nowadays, only three PSAs remain in force. In late 2015, Total decided to transfer 20 percent interest together with operatorship to Zarubezhneft20. The deal must be completed in the course of 2016. Disagreement between contractors over the production started after 2012, when Total decided to cut the production outlook due to its inability to boost production to the original plans. Total’s withdrawal from Kharyaga is essentially due to the fact that the company had failed to meet production targets21. In a context of decreasing oil prices, the French company decided to sell assets in order to increase its cash flow22. Secondly, Total was very interested in developing a gas division to trade, market, and ship natural gas and LNG. Historically, Total is an oil supermajor, but the diversification of its portfolio had gradually become a matter of priority. By investing in the Russian gas and LNG sector, Total killed at least two birds with one stone – access to new resources and diversification of its activities. It started in 2007 with the Shtokman project – a giant gas and condensate field located in the Barents Sea – operated by Gazprom (51 percent), Statoil (24 percent, StatoilHydro at that time) and Total (25 percent). Despite massive reserves (Shtokman being one of the world’s largest natural gas fields with about 3.9 trillion cubic meters of natural gas and 56 million tonnes of gas condensate), the development of the field was as complex as it was costly. The gas was supposed to supply northwest Russia and the European market through the pipeline Nord Stream spanning the Baltic Sea, and the USA via LNG cargos – a split that led to internal disagreements between partners and constant delays in the project. However, the U.S. shale boom, associated with a lack of tax incentives and high cost implementation, dealt a fatal blow to the project25. Due to serious difficulties among shareholders in redefining strategy, the project agreement expired in 2012. In April 2014, the French major wrote off 350 million USD in losses and in June 2015 it returned its 25-percent stake to Gazprom26. Total got its fingers burnt, but maintained its strategy, i.e. a long-running effort to participate in the development of Russian LNG. Third, Total wanted to find a reliable Russian partner with whom it could create a strategic alliance, and the Yamal LNG is part of it. This project should not only be seen as a possibility to recover its costs after the failure of the Shtokman project and significant losses, but also as a possibility to take an active and responsible role in a lucrative project, whereas Total took only a backseat in the Shtokman project. In 2004, Total acquired a minority stake in Novatek – a company with a portfolio made up of several giant fields and expanding rapidly on the Russian market, but lagging behind Russian majors such as Rosneft and Gazprom in the export sector. This acquisition was certainly the first big investment of a foreign company in a Russian gas company. In December 2011, Total increased its stake to 14.09 percent27, before reaching 16 percent in June 201328. From the French perspective, this alliance is also a means towards a rapprochement with influential business people close to the Russian government and a way to get an ability to lobby on issues where Total’s room for manoeuvre is inexistent or limited, e.g. right to export and taxes breaks (see below). Furthermore, it provides the French company with the possibility to counterbalance the powerful Russian-German alliance in Europe (E.ON-Gazprom and OMV-Gazprom to a lesser extent) by establishing a French-Russian alliance in the energy field that operates not only in Europe but internationally. This strategic alliance is of great value for Novatek too because it offers the possibility to “play in the big league” by developing activities outside the Russian market, as well as obtaining technological and financial support for the Yamal project. It is of note that Total has taken a very pragmatic approach, which consists in financing a project proportional to its shareholding, while easing financing constraints by mobilizing French FIs identified as potential lenders. The involvement of French FIs most often has a leverage effect in attracting other European FIs. strengthen Russia’s geopolitical influence in the Asia Pacific region. Indeed, the Yamal LNG project makes it possible to achieve some of the objectives set by the Russian government. European and Asian markets are accessible through the Northern Sea Route, with a westbound winter route (from November until June) and an eastbound summer route for the rest of the year. 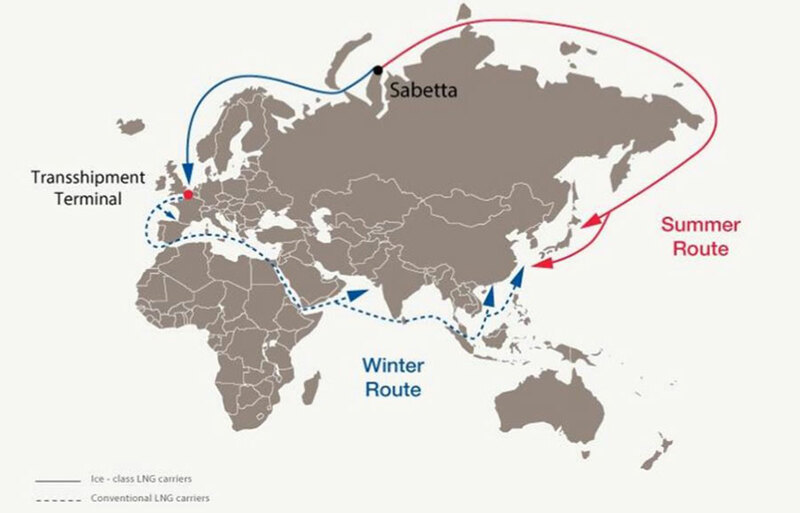 Nonetheless, LNG can be routed to virtually all relevant markets year-round through transfers to Asia via Europe during the winter period. Yamal LNG has clinched several deals to pre-sell liquefied natural gas both to European and Asian customers generally on a long-term basis29 (Engie, Shell, CNPC, and Gas Natural Fenosa…)30. The Yamal LNG project includes the development of substantial infrastructure, including the Sabetta seaport, Sabetta International airport owned by Novatek, a wastewater treatment plant, roads, fuel storages, utility networks, boiler house, living quarters and canteens as well as a power plant, and the construction and operation of an icebreaking fleet31 and a LNG tanker fleet, which will perform approximately 200 voyages per year. The achievement of all these objectives has required both strong direct and indirect support from the government: credit support, environmental costs (e.g. environmental fines from harmful activities such as dredging are covered by government funds)32, direct spending (port harbour, seaway channel, etc.). The necessary support from the government has been concentrated on two aspects: tax breaks and the liberalisation of LNG exports. and operating in regions well connected to the transport network. A large proportion of Russian oil and gas fields were put into operation in the Soviet era. From the early 1990s until 2005, Russia was producing more hydrocarbons than it was finding. But during the latter half of the 2000s, the exploration of new fields has become an imperative. Greenfields that could be put into exploration in Russia have been explored to a small extent, but have been mostly classified as small or medium, and most of them are difficult to access, which makes exploration capital-intensive, while infrastructure is less developed. The complex geological structure requires further expensive investments, which makes development less cost-efficient. In addition, costs increase due to harsher climate conditions and/or deep waters, as heavy investments and cutting-edge technology are often required. Three offshore regions have raised considerable interest: the Far East fields discovered in the 1980s and gradually put into operation during the 2000s (e.g. Sakhalin 2), the Arctic shelf, and the Black Sea shelves. However, the development of greenfields and shale plays has often been constrained by a huge tax burden that rules out the chance to compensate substantial upfront investments, thus only a very limited number of new fields will create value. Easing the tax burden, which hampers large-scale upstream development, will facilitate the upstream segment. Over the past few years, the Russian government prompted explorations via tax breaks on a very ad hoc basis. Yamal LNG has been exempted from all taxes. Without a tax break and other government support measures, the project would not have been completed under the benchmark system of taxation for the Russian oil and gas industry. At least, the project was economically viable, if the cost of infrastructure development was not included in the analysis. For example, in October 2013, President Vladimir V. Putin ordered to provide a new tax break for gas production, which helped Novatek to save over 4 billion USD and helped the company to boost its resource base34. The second turning point occurred on the 1st of December 2013, when a law on LNG export liberalisation came into force. Over the past years, the growing competition between Gazprom and independent Russian gas producers moved gradually from the domestic market to LNG exports. Rosneft and Novatek joined forces and lobbied Russian authorities to put an end to Gazprom’s export monopoly. The 2013 law partially reversed the 2006 law that gave Gazprom a monopoly on gas exports since it stipulates that Gazprom and its subsidiaries, “users of mineral resources that have a license to construct an LNG plant or to send their gas production for liquefaction, and companies that are more than 50 percent owned by the Russian government for gas produced from Russian offshore fields or under production-sharing agreements” can export LNG35, that is to say, Gazprom, Rosneft and Novatek. This is without any doubt the result of strong lobbying work that only Russian companies can provide. The law established this condition because the government would like to avoid dumping among Russian LNG producers. Groups such as Lukoil or Alltech Group, however, are not allowed to export LNG. If one looks closely enough at the agreements signed before the 2013 law, it may be argued that some would not have been completed without this law. Yamal LNG is a good example. Novatek and Total had beforehand signed all the necessary agreements with Gazprom Export in order to export LNG. With or without any liberalisation law, this gas would have been exported, as approximately 70 percent of production volumes were already under contracts when the law was passed36. It must be considered that in attractive export project financing, the credit quality of the project is driven by the credit worthiness of the off-takers more than the credit quality of the supplier. LNG transit remains fairly problematic and expensive for Novatek. An alternative would have been to market the gas in Europe through a pipeline. Gazprom rejected such a possibility since the exclusive right to ship gas via pipelines to Europe and Asia still remains under its sole control. It is expected that in the future Novatek may openly challenge Gazprom’s monopoly on gas exports to Europe. For the time being, this is not a priority in the eyes of the government as stated in April 2016 by Alexander V. Novak, Minister of Energy37, although it is difficult for the Russian government to find a balance between independent gas producers’ desire to export gas and the danger of damaging Gazprom’s position in Europe. Because of the social role Gazprom plays in the Russian society, it cannot easily be thrown to the curb38. Of note that the LNG export is liberalised by the law for Novatek, although the pipeline export is being under discussion, as only Gazprom has the infrastructure. However, using it would imply participating in its maintenance, which is expensive. It goes well beyond political considerations since it questions the concept of public infrastructure and the cost of it for private users. Over the last decade, U.S. sanctions have become more complex. The United States has understood that unilateral sanctions are effective in causing damage only in a very limited number of circumstances. If economic sanctions are implemented by simply prohibiting companies and firms from the country imposing sanctions (the sender) to engage in commercial activities with the target country, there is no restraint on the target country to find new business partners. There are various sanctions regimes, but they can be divided into two groups: 1) country-based measures and 2) targeted sanctions on individuals and/or entities, a more and more common practice which is increasingly becoming an integral part of the U.S. diplomacy machine. Sanctions are generally used to achieve precise objectives (e.g. regime change, peacekeeping, etc.). The array of sanctions imposed on the Russian Federation, and implemented by the U.S. Office of Foreign Assets Control (OFAC)40, is perhaps one of the most comprehensive efforts marshalled by the U.S. to put pressure on Russia with or without the support of Western European countries, since the lists of individuals and entities that are subject to EU and U.S. sanctions are not identical. The Executive Order (EO) 13662 signed on March 20, 2014 blocks the “Property of additional Persons Contributing to the Situation in Ukraine”41. Pursuant to EO 13662, OFAC issued a Directive on July 2014, which restricts U.S. persons from engaging in specific types of financial transactions for entities identified in a new list created by OFAC and entitled the Sectoral Sanctions Identifications (SSI List). The latter was implemented on the 12th of September, 201442. Directive 2 specifically addresses the energy sector. It prohibits “all transactions in, provision of financing for, and order dealings in new debt of longer than 90 days maturity of persons determined to be subject to this Directive, their property, or their interests in property”43. By “debt”, OFAC means: bonds, loans, extensions of credit, loan guarantees, letter of credit, drafts, bankers acceptances, discount notes or bills, or commercial paper. U.S. sectoral sanctions, consistent with most OFAC regulations, only apply to U.S. persons (more broadly U.S. nexus) under OFAC’s jurisdiction, i.e. “any United States citizens44, permanent resident alien, entity organized under the laws of the U.S. or any jurisdiction within the United Sates (including foreign branches), or any person in the United States”. The restrictions entailed by the sanctions are comprehensive. Firstly, the sanctions forbid any transaction in U.S. dollars. Secondly, any transaction is forbidden if the bank is a U.S. entity. Thirdly, a U.S. person/nexus operating in a foreign jurisdiction cannot be involved in negotiating, approving or otherwise facilitating any portion of a prohibited transaction. The person would have to remove himself/herself from any communications, meeting or decision-making involving the transaction. In other words, the restrictions of EO 13662 and Directive 2 should not apply to a bank’s involvement in a deal as long as no U.S. citizens are directly involved in the deal and the transition does not involve U.S. dollars. EO 13622 also contains a clause that allows OFAC to seize the property of anyone determined to “have materially assisted, sponsored, or provided financial, material, or technological support for, or goods or services to or in support of, any person whose property and interests in property are blocked pursuant to this order”. This clause is not used to impose secondary sanctions on non-U.S. persons like the Iran sanctions (put into force by the US in 1995, Iran Sanctions Act) require. It must be understood as the basis upon which a person is designated as a Specially Designated National (SDN) or “blacklisted”. This provision would apply to any of the financing institutions involved in a transaction under risk, if OFAC designates the borrower as a SDN, and then subsequently uses this provision to designate the bank of other respective financing institution a SDN – to date, this specific activity has not been subject to sanctions, but legally, it could be. So far, any reputable Western bank has not been designated a SDN. the FI knowingly facilitates a significant financial transaction on behalf of any SDN that has been pursuant to the Ukrainian crisis. Although U.S. sanctions target the Russian oil sector, not the gas sector, the development of Yamal LNG is seriously affected since Gennady N. Timchenko, a businessman allegedly close to Vladimir V. Putin, has been subject to U.S. sanctions (and has been on the SDN list) since March 2014. Mr. Timchenko’s investment holding, Volga Group, has been included in the SDN list because of the close relationship the group’s main shareholder (Timchenko) has with the Russian leadership. OAO Novatek is on the SSI list and, as a consequence, suffers under U.S. capital market restrictions. How do FIs and corporations deal with the risk? Yamal LNG investments rely on investment grade entities to ensure sufficient long-term revenues to support this multi-billion dollar investment chain. This requires the establishment of a methodology of risk identification. The most important part of responsibility and/or risks is covered by strong and competent sponsors (e.g. completion risks in all its variety, project costs, operating risks). The value of the project promoted by such strong sponsorship would help to transfer some risks on the creditworthy off-takers and the project's financial risks could be partially backed by a large and diversified FIs community. FIs, as lenders, are exposed to several risks and challenges intrinsically linked to the financing of this large-scale greenfield hydrocarbon project in the Arctic, developed under harsh climate conditions. 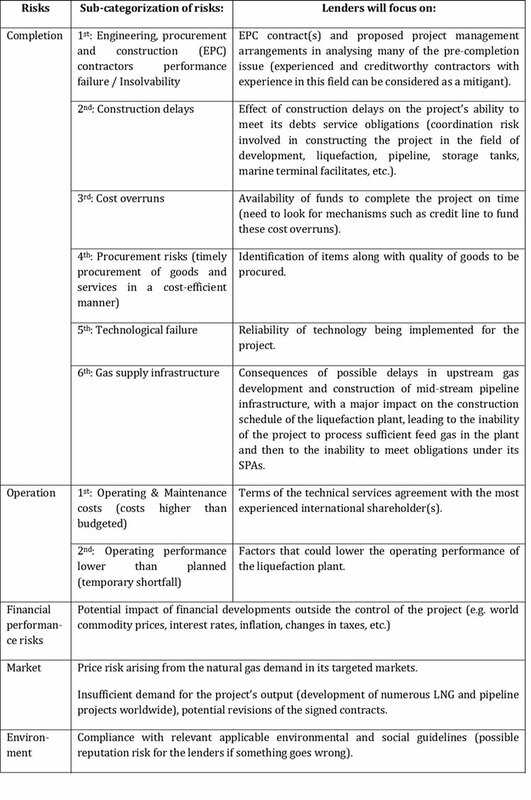 Access to an adequate amount of funds to meet the sizable financing requirements over the several phases of the project, meeting the sizable equity funding requirements and completion of guarantee obligations, and bankable LNG SPAs are among the biggest challenges. In the first half of the 2010s, the Yamal LNG project risk analysis could be divided into six main categories of risks – completion, operation, financial performance risks, gas supply, market and environment. U.S. sanctions expose both majors involved in the project and FIs to new risks. The former have to consider the way they will deal with the SSI list or entities controlled by SSI entities; how to address sectorial sanctions (i.e. obtaining special permits for dual purpose technologies); react in case of an aggravation of sanctions; and avoid transactions in US dollars and with US nexus in upcoming transactions. The latter essentially focuses on the risk of illegality and secondary sanctions. As a first step, FIs can consider the possibility of precluding a U.S. nexus (i.e. no new debt denominated in USD and national employed by a bank involved in the deal). In other words, no money should flow from, to or through a U.S. entity, while no U.S. person, no matter where they are located, should be involved in the deal in any way (e.g. negotiations, communications, discussions, etc.) because they are deemed to be a risk. However, it might be tricky if the repayments under the credit facility are tied to sales of liquid hard currency and if those sales are in USD. In this case, nothing prevents OFAC extending its jurisdiction. Then, FIs should ensure that counter-party (often the borrower) would not engage in agreements that may cause a bank to violate U.S. sanctions (and affect its reputation at the same time). In this very specific case, the FI would include indemnity provisions in future agreements to cover this risk associated with hypothetical violation of sanctions by the counter-party and take measures to mitigate the possibility of a sanctions violation that may lead to enforcement action and/or a penalty from the OFAC. Nonetheless, it is impossible to ensure that the counter-part involved in the transaction will not violate sanctions despite prior precautions. The situation in Ukraine remains at the heart of the matter – a factor which is pretty hard to control. The situation remains uneasy and nothing protects Russia from new sanctions. The risk of illegality means that new sanctions would make the participation in new funding or new lines of credit (i.e. providing a certain amount of loans to the borrower up to a certain limit) illegal. The illegality of an on-going funding would immediately stop the FI’s lending lines of credit. As a consequence, the borrower would have the obligation to pay back the credit immediately. If the borrower would not be able to do this (which is generally the case), it would require the call for guarantees before allowing lines of credit. An export agency such as France’s COFACE would act as a guarantor. In this case, the borrower would be covered up to 85-100 percent – depending on the agencies’ requirements. Up to this stage, a compromise can be found between majors, FIs and export agencies. One can observe some reluctance on the part of European FIs to further finance the Yamal project due to a number of new risks, including regulatory considerations which must now be added to the risks identified before sanctions. From the Russian perspective, Yamal LNG is not just an economic stake (though it should be stressed that for Novatek the project is the largest investment and the main growth driver in the future), but it has also become a political issue. Firstly, the project is developing Russia’s presence in the Arctic region and Northern Sea Passage, which has immense geostrategic importance for the country. Therefore, from the very beginning, the government has viewed Yamal LNG as a strategic project and has granted it exceptional tax breaks and support from the National Welfare Fund for the development of the transportation infrastructure. Secondly, sponsors of the project are under scrutiny from U.S. regulators. And third, it will be competing with the U.S. LNG both in Europe and in Asia, which spices things up a bit. Furthermore, the situation is in no way a cat-and-mouse game. The U.S. sanctions have imposed economic hardship on the Russian Federation. They can remain in place or be intensified on several different grounds, until the target country accedes to the sender country’s demands, but once they have been put in place, the latter has to wait, hoping that economic distress will change the former’s behaviour (long-term strategy). On the contrary, there are several options available to Russia. It can bend to the sender country more or less rapidly, or it can start looking for alternatives – the option chosen by Russia –, conducting a cost-benefit analysis. What are the consequences of sanctions on the economy on the short and medium terms? How costly is it to evade the effects of sanctions? What could strengthen or mitigate the impact of sanctions? Does it require a restructuring of economic ties with Western countries, in order to diminish the impact of possible future actions by the West? This is just the beginning of a long list of questions. In 2015, sources of funding initially shrank fast. Financing could not be provided on a competitive basis. The Russian state brought support – for example the project has received 150 billion rubles from the Russia National Wealth Fund. As a consequence, marketing choices gradually turned to Asia, mainly because of the tense political atmosphere in relations with the West and of the risk of U.S. penalties which, as was explained before, deter EU FIs (major debt providers). On Novatek’s side, raising capital could be done through equity financing, i.e. through the sale of shares. In September 2015, the Russian company and the Chinese Silk Road Fund (SRF) signed a framework agreement on the acquisition of a 9.9-percent equity stake in Yamal LNG48. The transaction was finalised in March 2016 for a payment amounting to 1,807 million EUR49, making the shareholder structure as follows: 50.1 percent Novatek, 20 percent Total, 20 percent CNPC and 9.9 percent SRF. Equity finance is not without risks as the payment of the investors is highly dependent on the success of the Yamal LNG. If no profit results from the project, it would have an adverse effect on the payment possibilities of investors. This is certainly why both Novatek and Total definitely want to launch LNG production no later than in 2017. However, it seems that no further need for shareholders financing is now required, as future financing will be derived from external sources. The project was 53-percent completed as of the end of the first quarter of 2016 compared with 45 percent at the end of 2015, while 65 percent of train one is already completed50. Obtaining cash by incurring debt has been another way to get funding. Novatek could find new lenders and borrow at a fix rate with a predetermined maturity date, as long as no USD is used in the transaction. It means that it could be in Euro or Yuan with no U.S. nexus. It can take the form of a loan and/or sale of bonds. Two lenders have been identified. Russian banks, i.e. Sbirbank and Gazprombank, will put up the total amount of 3.6 billion EUR for the next 15 years51 – a decision taken in April 2016. The National Wealth Fund of Russia will provide 150 billion RUB52. In mid-April, Patrick de la Chevardière, Total CFO, announced that Yamal LNG was working to raise the equivalent of 12 billion USD in financing from Chinese banks53. An agreement with the Export-Import Bank of China and the China Development Bank was signed on the 29th of April 2016. It allows two 15-year credit line facilities for a total amount of 9.3 billion EUR as well as a 9.8 billion RMB54 at EURIBOR 6M55 plus margin of 3.30 percent at the construction stage and 3.55 percent after the full commissioning of YAMAL LNG56. Moreover – the problem with the technologies was solved in quite a surprising way: for the first time ever, modular Chinese liquefaction equipment will be used57. Consequently, external financing is now fully de-risked. Novatek has regained total control over its current cash flow since it has no need to inject its own funds into the project. Nevertheless, the Russian company remains exposed to volatile oil prices, mainly because of the oil-linked pricing. According to Sbirbank estimations, at 30 USD/bbl, the project would only generate enough cash flows to service debt payments58. Only an oil barrel above 30 USD can allow reaping cash from Yamal LNG. Is the EU losing ground? On Total’s side, the situation is very uncomfortable. Firstly, the company is gradually losing the “added-value” of its strategy consisting in offering financial support while mobilizing European FIs – French first of all. Secondly, the new configuration reduces the French-Russian dimension of the project and may lessen the influence that Total has over the Yamal management team..
Total does not seem to be ready to raise capital through equity financing60. The French major has currently two main priorities. It keeps negotiating with COFACE to gain support from the export agency since European banks require the call for guarantees before allowing lines of credit61. It is however obvious that due to the current situation French FIs can offer less than initially thought. Furthermore, the longer negotiations drag on, the more Russians are likely to turn to Asian options. More generally, European influence may decrease further if future transactions are made in Yuan. This has not been the case yet, but the gradual de-dollarization in the financing of major Russian energy projects would have a negative impact on the European currency. Last but not least, this shareholding overhaul is not good from a competition standpoint in Europe – even if this aspect might be a minor subject. By blocking the progress of some Russian projects, sanctions prevent the development of competition on the EU gas market. The European Union has never endorsed Gazprom’s monopoly. In 2003, the Europeans called for the abolition of the de facto monopoly situation in the World Trade Organization negotiations, but Russia made no concessions. On the contrary, the 2006 law cemented Gazprom’s export monopoly62. Thereafter, the EU has repeatedly asked for a diversification of Russian gas supplies, especially after the 2014 Russian-Ukrainian gas crisis63. Yamal LNG is one of the projects that have the potential to facilitate the introduction of competition by rapidly increasing liquidity on the European gas market. Over the past few years, the Russian energy sector has been hit hard at the international level by: the global financial and economic crisis; the US shale revolution; the demand slowdown on domestic and international markets for economic and/or efficiency reasons; the degradation of political relations with major gas consumers, such as Ukraine, Turkey, and the EU, fostering policies of diversification of supplies in a number of countries and a limitation of Russian gas imports in the case of Ukraine; the increased supply of hydrocarbons largely determined by OPEC’s refusal to reduce its production, and resulting in a lower price environment... At the national level, Russia has had to deal with the depletion of cheap brownfields inherited from the Soviet era and the need to explore greenfields, generally hard-to-recover due to climatic and/or geological characteristics often located in remote places. The development of Russian greenfields has been held back due to a price slump which has made the financing of projects even more difficult. In the oil sector, U.S. sanctions have had no massive direct effect in the short-term, since such projects were supposed to come online later (in 10 years’ time), but they have dissuaded Western oil companies from investing massively in the development of those resources. However, the Yamal LNG project has been quickly exposed to growing problems with the access to financing in the context of U.S. sanctions. The financial risks had become really painful to bear for energy players such as Novatek, Total and CNPC before the signature of agreements with both Chinese and Russian banks. From now on, the project can be financed via loans and CAPEX. The shareholder managed to mitigate major risks even if currently, two risks remain: the risk of delays and the risk connected to low oil prices. European FIs are gradually restructuring their ties to Russia in order to diminish the impact of possible future actions by the U.S. At the same time, European energy companies are restructuring their ties to European FIs, with unfortunate consequences in the near future. Consequently, marketing choices are gradually turning to Asia rather than the EU. Of course, such a trend can only accelerate Russia’s “Pivot to Asia” strategy announced by the Russian government a few years ago, especially after falling out with the West over Ukraine. Adjustment is not a straightforward matter, but the current international situation is turning the Yamal LNG into a French-Russian-Chinese project. 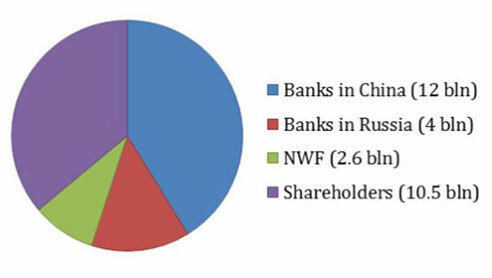 Debt from Chinese and Russian banks will largely dominate the lenders’ pool, while the de-dollarization of both Russian banks’ balance sheets and funding of Russian energy infrastructures is expected to increase in the near future, especially if the U.S. and the EU decide to maintain its sanctions against Russia over the long term. In other words, the longer secondary sanctions stay in place, the faster European FIs will lose their influence on the funding of major Russian energy projects. True, Asian countries remain quite cautious because they do not want to put their relationship with the United States at risk. Negotiations between Russia and China are not that easy, and overall Russia’s “rebalance” to Asia is not going to be a long, quiet river. However, the reinforcement of Russian state control over the energy sector is obvious. The Yamal project has become a serious political issue. Although this would lead to a somewhat ambiguous situation, state and private interests seem to converge since both want to obtain the resources to match their ambitions despite the sanctions. Sectoral Sanctions Identifications (SSI List).